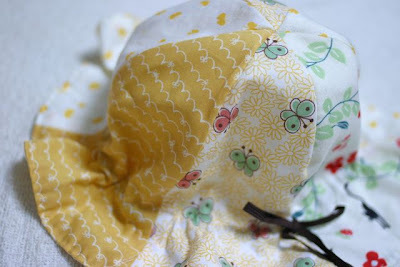 Today, I explain you how to make the kimono origami to respond the request of veronica. It's a little complicated so I'm afraid if I can tell you well. (1)Prepare square paper and cut it in half. 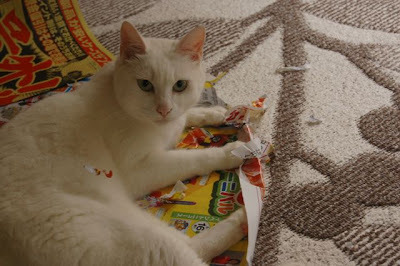 (2)Fold it in half to make a crease and fold back. (3)Fold a little to make a collar. (4)Then fold the collar side to the center line. 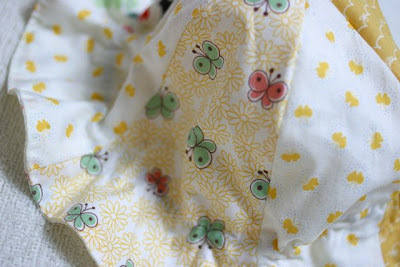 (5)Turn it over and fold the collar side to the line that you made in the step (4), like this picture. (6)Turn it over and fold it like this. The width of the bottom is a little wider than the collar. (7)Fold to the back the other side in half. The opposite side is like this. (8)Fold both side to the collar, and open it, as shown in the following pictures. (9)Fold the back of the collar to the back. 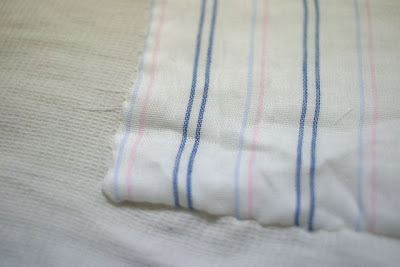 (10)Fold the back side in half to make sleeves. If I couldn't explain it in a good way, please leave a comment. Thank you!!!! To have a small shop. In the shop, I want to do three things. The first and biggest one is tourist information for foreigners. Whenever I guided my friends from Italy or United States, they were embarrassed because most of Japanese people didn't speak English at all. When I stayed with John, from Germany, we entered many kinds of shops and restaurants. But in only one restaurant, people spoke to him in English. 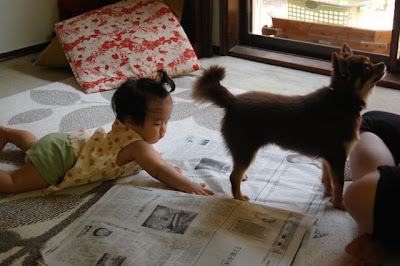 Most of Japanese people have learned English in their schooldays. But they have little occasion to speak it and they think it's shame to make any mistakes. So they don't speak. But when I traveled in Italy, the U.S., or Korea, people spoke to me in English or in poor Japanese. If I couldn't understand what they were speaking, they tried to make me understood. I feel very comfortable while I'm traveling in foreign countries. So, I want to do the same as they did for me. I traveled a lot so I was helped from many people. I feel it's my turn. Especially, I'm really good at organization. Whenever I travel by myself or with some friends, I organize all by myself. Because traveling time is very precious for me, I don't want to lose our time. And I like eating very much, so to find good restaurants is really important for me. I want to talk with people and tell them where to go, eat and stay. But I don't want to work in tourist information office Japanese. I checked how they talked with people who visited there, and noticed they only answered the questions. They don't say any greetings, and they don't smile. I don't like the style. So I want to have my own tourist information. The second is to offer chili beans. I like it very much but it's difficult to find it in Japan. So, I want to offer it for travelers. The last is to sell my items. Now I'm selling them on ETSY, but actually I want to talk with my customers, face to face. If you come to Japan, please contact me! I'll tell you some good restaurants and some good places to visit. And if you want, I can guide you!!!!! Now, I'm staying my parents house for a week. Almost every day, we meet my niece lives very near here. She is 9 months old now, and smile a lot. And when we don't meet her, I sew something for her or my mother. 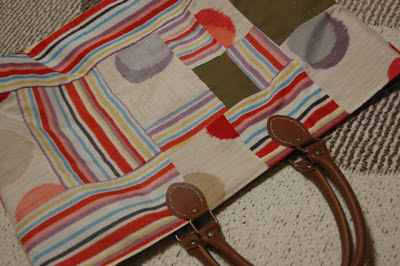 Yesterday, I made a bag for my mother. The fabrics I used for it are what my mother found in a small fabric shop. There fabrics are very narrow so I had to patchwork them. 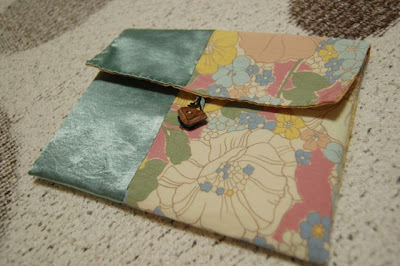 And today, I made a pouch with other fabrics. I went the fabric shop and bought some fabrics. The green satin fabric is also narrow one, and it costs only 20 cents a meter! It matches with flower printed one very much. I got some new fabrics now, so when I return to my apartment, I'll sew new items. For more 3 days, I enjoy with my little niece. Oh,,, and two cats and a dog! In our room, there are some holes. One big hole is in a sheet. I put a piece of gauze on it. During our trip to California, my boyfriend's socks have holes. Some of them, we sewed together in a hotel in San Francisco. It's because he didn't have many ones in the trip and he didn't want to buy new ones. 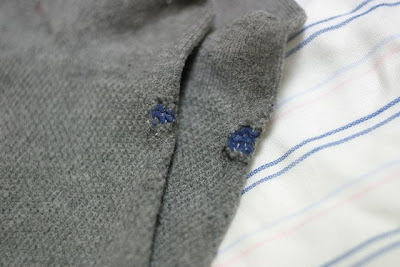 Today I realized some other socks have holes too, so I put a part of my old camisole on it. I'm wearing his old shirts that had some holes. I cut the part and remade to fit me. After we closed holes, they seems more important for us. I made a small hat for my little niece too. 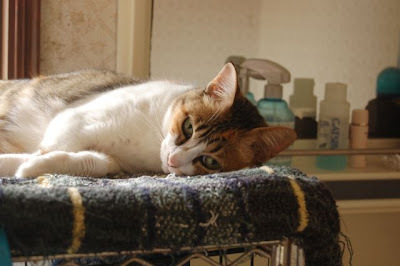 I'll go to see her maybe next week or later. I hope she likes it.